How does your home feel when you walk in the door? Is the space serene and restful—a bulwark against noise and cares? Or is it a place of disorder bordering on chaos, where lost items make your daily departure a frantic scramble? Which version do you prefer? (And you may find that the lost keys/wallet/phone search gives you a jolt of energy to face the day…) If you would like something different, how willing are you to do the work? Autumn heralds new beginnings and a clean slate. It may not be fall yet, but geese are starting their migration. Schools are resuming and yellow buses complicate the traffic fray. The anticipation of cooler temperatures proclaims the seasonal clothing switch ritual. When we moved every year or two with the military, there was a natural opportunity to touch every household item and determine its fate: keep or release. Without that impetus, fall and spring make good times to evaluate and clear. Have you accumulated enough fabric to piece a blanket for every person on your block, if sewing was how you spent all of your discretionary time? Are electronics the centerpiece of every room, with the obsolete versions still lingering in corners? Have you inherited treasures that remind you of a beloved relative or are they a roadblock to moving forward? Do you fancy yourself a bibliophile and can’t resist acquiring books? Are you convinced mugs or cloth bags are secretly replicating behind cabinet doors? Every item reveals the individual or family. When you’ve lived somewhere for a while, your senses have habituated to the message your house conveys to visitors. While we may know our quirks, it doesn’t make them easier to address, so it’s essential to team up. If you are serious about clearing, the critical element is finding a neutral party as your battle buddy; whether a friend or a paid organizer to help facilitate the process. There is a reason our homes look the way they do and inertia is a force that keeps them like that. Homes are a self-portrait and our belongings communicate about what is important to us. So, think about tidying as a dialogue with yourself. In The Life-changing Magic of Tidying up, Marie Kondo recommends a specific order for decluttering. Because of emotional connections, some things are harder to get rid of than others. Start with the most easily replaceable items with the least emotional ties. The author suggests beginning with clothing and then books, papers, miscellaneous, and ending with mementos (including photos). Again, you know your foibles. If fashion is your thing, start with a less emotionally charged category. Should you sort category by category or room by room? Start with what’s easiest for you. Visualize the space you want and look closely at what is there. If an adult child now lives independently, but is still storing a roomful of belongings, that may make a good starting point. The owner has outgrown the possessions, since these items did not make the cut for the new space. Box the items for the owner to peruse and decide. Create your habitat by choosing what to keep and showcase, then editing out the rest. Bottom line: the question of what you want to own is the question of how you want to live your life. 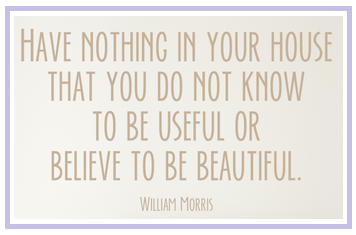 Tidying is about restoring balance among people, their possessions and the house they live in. Appreciate your belongings and eliminate excess that doesn’t inspire joy or make your space more peaceful. Transform your life. Outer order; inner calm. ← How Old Does Your Child Have to be to Enjoy Reading Aloud?